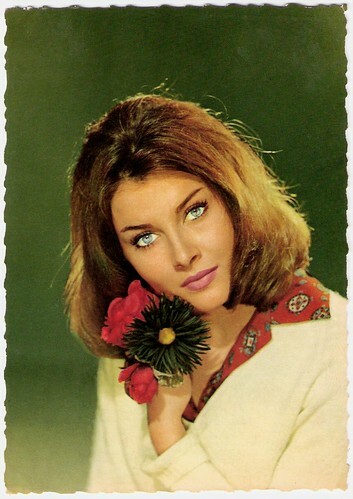 After a successful career, French star, singer, actress, author and writer-composer Valérie Lagrange (1942) retired from the mainstream show business and appeared in several counter culture films of the late 1960s and early 1970s. French postcard by E.D.U.G., no. 84. Photo: Sam Lévin. German postcard by Krüger, no. 902/140. Photo: Gérard Decaux. French postcard by E.D.U.G., no. 268. Photo: Sam Lévin. 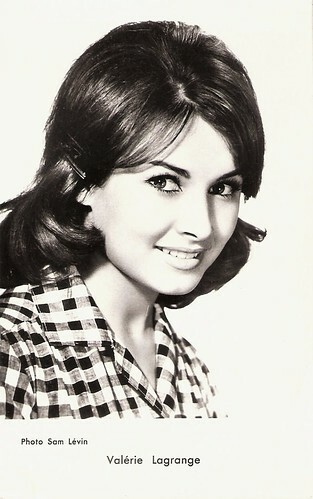 Valérie Lagrange was born as Danielle Charaudeau in Paris, France in 1942. She made her film debut in La Jument verte/The Green Mare (Claude Autant-Lara, 1959) at the side of the famous comedian Bourvil. Many scenes of this film take place in a barn (in French: grange) and that’s why she was renamed Valérie Lagrange. She was influenced by the new music that arrived from the US like the rock and roll of Elvis Presley. She made several records, including the hit songs La Guérilla by Serge Gainsbourg, Encore un jour de notre amour and Le Même jour by Francis Lai and Pierre Barouh. She listened to protest songs by Bob Dylan and Joan Baez, and discovered the Rhythm and Blues by Wilson Pickett and Otis Redding. Meanwhile she appeared in films like Le Gigolo/The Gigolo (Jacques Deray, 1960) with Alida Valli, the anthology film La Francaise et l’amour/Love and the Frenchwoman (Michel Boisrond, 1960), and the Italian Swashbuckler Morgan il pirata/Morgan, the Pirate (André De Toth, Primo Zeglio, 1960) opposite Steve Reeves. 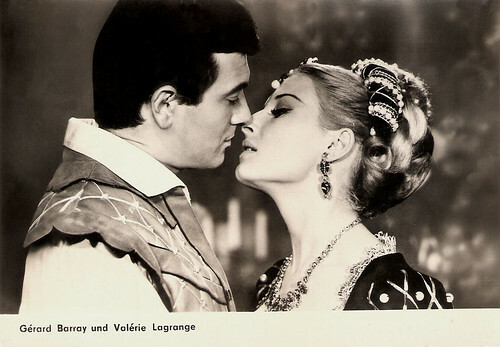 Later she played in the Arthur Schnitzler adaptation La Ronde/Circle of Love (Roger Vadim, 1964), in the Swashbuckler Hardi Pardaillan!/The Gallant Musketeer (Bernard Borderie, 1964) opposite Gérard Barray, and with Jean-Paul Belmondo in Les Tribulations d'un Chinois en Chine/Up to His Ears (Philippe de Broca, 1965). 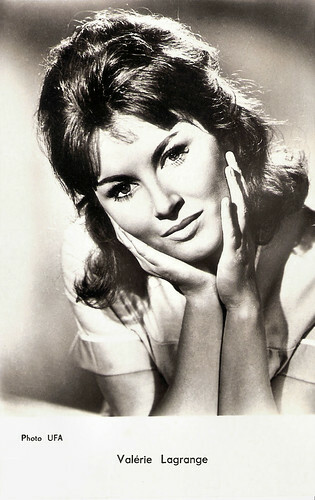 Lagrange also performed on stage in Othello (1963) and Le Misanthrope (1964), and she posed for the first edition of men’s magazine Lui in November 1963. French postcard by Editions P.I., Paris, no. FK 109 A, presented by Les Carbones Korès 'Carboplane'. Photo: Ufa. East-German postcard by VEB Progress Film-Vertrieb, Berlin, no. 2960, 1967. Photo: publicity still for Hardi Pardaillan!/The Gallant Musketeer (Bernard Borderie, 1964). East-German postcard by Progress Film-Verleih, Berlin, no. 2961, 1967. Photo: publicity still for Hardi Pardaillan!/The Gallant Musketeer (Bernard Borderie, 1964) with Gérard Barray. In 1966 director Claude Lelouch offered her a role in his Oscar winning drama Un homme et une femme/A Man and a Woman, and the following year Jean-Luc Godard cast her for his classic Week End/Week-end (Jean-Luc Godard, 1967). 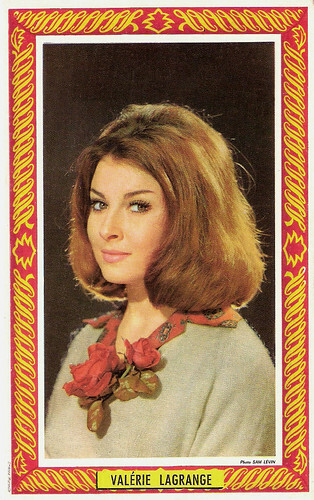 She also appeared in the Petronius adaptation Satyricon (Gian Luigi Polidoro, 1968). After May 1968, she retired from the mainstream show business. She mixed in the hippie culture and in 1970 she recorded the first French Reggae song, Si ma chanson pouvait (1970). She went to New Guinea to play in the emblematic Beatnik film, La Vallée/The Valley (Barbet Schroeder, 1973). She also stayed in the Provence and at the Baléares islands, and travelled through India and in Italy. Lagrange, was an authentic hippie, who felt like a spiritual sister to Jack Kerouac. In 1973 she met the British guitar player Ian Jelfs of the band Alice, with whom she performed songs by Leonard Cohen, Bob Dylan and Donovan. Lagrange played in some films of her friend Lelouch: Le Chat et la Souris/Cat and Mouse (1975), Le Bon et les Méchants/The Good and the Bad (1976), and Si c'était à refaire/If I Had to Do It All Over Again (1976). Her later films include Mes nuits sont plus belles que vos jours/My Nights Are More Beautiful Than Your Days (Andrzej Żuławski, 1989), and Joueuse/Queen to Play (Caroline Bottaro, 2009) with Sandrine Bonnaire and Kevin Kline. She also appeared several times in TV series, like in The Hitchhiker (1991). In 2009, Valérie Lagrange and Ian Jelfs finally married after a long and tempestuous relationship. Lagrange published her memoirs in 2005: Mémoires d'un temps où l'on s'aimait, autobiographie, and in 2007 Philippe Malidor published the biography Besoin d'amour. French postcard by Ste. Anne, Marseille. Photo: Sam Lévin. French postcard by Editions P.I., Paris, no. 1056. Photo: Sam Lévin. French postcard by Editions P.I., Paris, no. 1061. Photo: Sam Lévin. 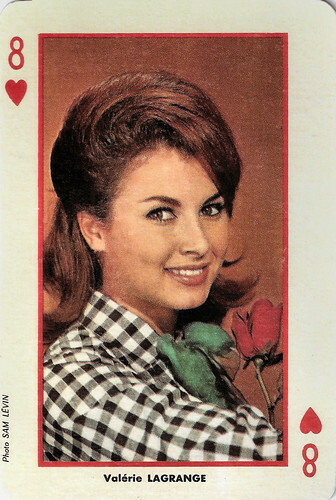 French playing card. Photo: Sam Lévin. French postcard by Editions Borde, Paris, no. 125. 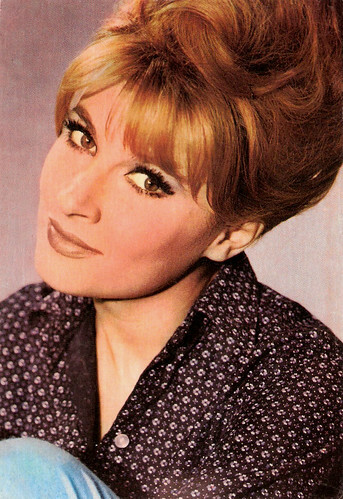 Vintage clip with Valerie Lagrange singing Moitié Ange Moitié Bete (1966). Source: TheoChris (Daily Motion). Thanks for dropping by and humming along to Bonanza! I've never heard of this lady, and she does look like a lady. Great post. I do like the comparison with Jackie O. Their hairstyles look alike. I guess both ladies were popular at the same time. Hope to see you again, next PFF friday! Gee, I have missed your blog and all your fun trivia. I have been oh so busy these past weeks and unable to play in PFF. I remember her from Week - End but you have certainly peaked my curiosity (you always do) Thank goodness for you tube. I love getting little (and big) tastes of al of this film history! And Marie, my PFF posts are all about French stars, because I thought you were French. And now it's so nice to discover the French cinema with you. Great post! I have seen her in a few films but didn't know any details. She has had a lot of fun in her time!